This is the first 13steps scouting report, for new Liverpool signing Christian Benteke. Over the course of the Summer, we will look to create more of these for other new signings. If there are any players you would particularly like to see, then you can make a request on our Twitter account. We will also introduce a few new concepts that will be a consistent theme throughout the reports. There has been much debate over the suitability of Christian Benteke for Liverpool’s style of play. Therefore much of this report will be detailed towards his ability to fit into Brendan Rodgers’ team. Benteke moved to Aston Villa in 2012, for a fee of around £7 million. It has since been suggested that Liverpool had first refusal on Genk players at the time, meaning that they must have refused to match Villa’s offer. They went for £10 million Fabio Borini instead. Since signing, Benteke has scored 42 league goals in 88 appearances for Aston Villa. 6 of these have come from penalties (= 36 non-pen goals), giving him a Non-Penalty Goal per 90 tally of 0.44, only marginally above the average level of a Liverpool striker over the last three years (0.43). His best season came on arrival in England, where he managed 0.51 per 90. His form dropped in 13/14 (to 0.34 per 90) before rising to 0.45 per 90 last season (14/15). There are a number of reasons Liverpool want to sign Benteke. But chief amongst those is his goal-scoring ability. With Daniel Sturridge injured for much of the 14/15 season, Rodgers will be wary of repeating the same recruitment errors. Raheem Sterling was left to play in an unfamiliar striking position for much of the season and Liverpool’s attack lacked potency. Benteke’s goalscoring numbers are largely propped up by his finishing ability. This is proven by his consistent over-performance in Expected Goals (xG1). xG2 is the goals that are ‘expected’ once the shot has been taken. Much of the difference between xG1 and xG2 can be explained by finishing ability. Benteke outperforms his Expected Goals each season. Doing so three seasons running is very tricky; this would suggest he’s a pretty talented finisher. Which is always a handy asset for a striker. But it is also a major worry for a team looking to buy him, as Expected Goals are a better indicator of future scoring performance. The other major worry for Liverpool is where those goals come from. 31% of Benteke’s Aston Villa goals came from headers. Liverpool are one of the lowest crossing teams in the Premier League (19th) with 17 per game. But Aston Villa are also moderately low, with 20 per game (14th). Yet crosses still provide such a large portion of Benteke’s goals. Benteke’s goal tally noticeably improved when Tim Sherwood came in and played to Benteke’s strengths; massively upping the crossing numbers. It is clear that Benteke is a striker who thrives on balls into the box from wide areas. Of the four assists in advanced central areas, one was a penalty that he rebounded, one was a direct free-kick, and another was a flick-on from a corner. If you’re a team who plays with width, who have full-backs who cross well from deep, and a lack of creativity centrally, then Benteke is your man. He is able to create goals out of nothing from knock-downs and second balls. But for a team that contains the passing ability of Coutinho & Firmino in central areas, it seems unlikely that Benteke will fit. The logic behind the signing seems to be Benteke’s danger zone shooting; an area Liverpool struggled with tremendously throughout the season. Despite creating a number of key chances, the likes of Balotelli & Sterling were often unable to convert them. For 2013-14, Liverpool’s Danger Zone scoring % was the best in the league, with 62%. Sturridge & Suarez, aside from being deadly in other areas, were the best close-range finishers in the league. But that plummeted to 39% in 2014-15, good enough for 18th in the league. Liverpool clearly need a finisher. Their recruitment seems to be in line with this. Danny Ings & Christian Benteke are both players who are good danger zone finishers, but also contribute more than the typical ‘poacher’. One other area where Benteke would contribute goals is from set pieces. He is Villa’s regular penalty taker, and his direct free kicks have noticeably improved over the past 18 months. His aerial threat from corners is obvious, and this would provide yet another scoring avenue that Liverpool had to go without during the 14-15 season (but also had in abundance during 13-14). Benteke’s goals video from 14-15 clearly highlights his aerial strengths, and the fact he relies on crosses for many of his goals. Much of the media supporting Benteke’s move to Liverpool has cited his profile as a ‘complete’ forward. He is expected to get onto the end of passes from Liverpool’s creative midfielders, but also to create chances for himself through his power & pace. But the reality is that despite relatively limited movement, Benteke also finds it difficult to create his own shots through the dribble. In an article for StatsBomb, Colin Trainor was able to create a metric called Pre-Shot Dribble Distance (PSDD). This metric examines the median number of metres that a player dribbles with the ball before they shoot. 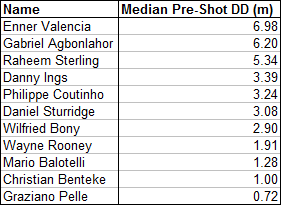 14/15 Pre-Shot Dribble Distances for Liverpool & Aston Villa forwards, as well as other noticeable reference points (data is sourced from Opta). This means that Benteke’s shots will often be taken from near the space where he initially received the ball. This is fine; being near the bottom of this table does not represent a lack of quality. But it does indicate a way of playing that may not allow him to easily become a part of Liverpool’s attack. With limited movement, and an apparent lack of capability to create his own shots, Benteke has always struggled to be a high-volume shooter. This may change with added vision around him, but that creativity comes from different areas than he is used to at Villa. When the ball comes in from wide areas, it is easier to play in front of the defense, as Benteke prefers. However, does this show the full story? Is Benteke totally unable to create his own shots? Whilst we’ve established that Benteke has difficulty creating shots, this doesn’t seem to be the same on both halves of the pitch. When receiving the ball on the left of the pitch, Benteke is running at an angle where he can open his body and side-foot the ball into the far side of the net. His good finishing makes it very difficult to save these shots, and against QPR (the most central of the three left-sided goals) he even shot into the near-corner, sending the goalkeeper the wrong way. This may create a deadly partnership with Daniel Sturridge, who has a similar proclivity for cutting inside, but from the other side. Liverpool found large amounts of success playing with a diamond in 2013/14 and Benteke’s arrival may signal a return to that shape. It’s also perhaps not surprising that his low PSDD is incredibly similar to potential teammate Mario Balotelli. Whilst Liverpool’s offense needed a player capable of making runs beyond the last man, Balotelli often wanted the ball to feet. The attack would stagnate, and the result would often be a goal kick to the opposition. But the difference between Benteke & Balotelli comes with their moves to create space for themselves. When Benteke receives the ball to feet, he is better at creating a yard of space between himself and the defender. Balotelli arguably has better close control of the ball, but Benteke is able to use intelligent body positioning & movement to create space for himself. Benteke scores a wonderful goal from nothing against West Brom; the finish was magnificent, and so was the body feint that allowed him to beat the first defender. This time he manages to create a yard of space between himself and the defender with patience, composure and basic side-to-side movement. What a finish, too. This highlights not only the acceleration of Benteke, but also the intelligence; to decelerate with the ball before immediately accelerating again shows a clear intelligence and awareness of his & the defender’s abilities. There are more examples of Benteke being able to manipulate a small amount of space in order to get a shot away, and this bodes well for his ability to attack against a deep block. This is something he’ll have to work even harder on; Aston Villa rarely come up against deep defensive lines, whereas Liverpool often do. Benteke is a back-to-goal striker. In initial build-up phases, he will stick to the last central defender before pushing back as the ball reaches midfield. Once he has reached the #10 zone, he often receives the ball to feet. This creates a difficult conundrum for the opposition CB; do they give him space or push up with him? The right decision is to let him push deep and stay back, maintaining structure & correct positioning. This is because Benteke is generally more dangerous with his back to goal, creating space for runners in behind him. Situation in an FA Cup match vs. Leicester: Benteke drags his CB away from his position, creating a very promising situation for his side, due to good off-ball runs from his teammates. Because of this facet of his game, and the fact it is very difficult for a defender to move past Benteke to steal the ball due to his sheer size, he is excellent at progressing play from the middle third to the final third. In isolation, this can be a good tactic that enables a better position to attack from, but when combined with runners it creates dangerous attacks. Whilst the diamond may allow Benteke to flourish when facing goal, it would also inhibit his ability to build-play, where he often utilises the wide passing option. Benteke will then spin behind and look to re-involve himself in the play. For Villa, this tends to be positioning himself near the back post to allow a run-up for a cross. This will likely be different at Liverpool. Once the ball is in the final third, Tim Sherwood’s Villa would generally have only one aim: get the ball to Benteke. With Benteke dropping into the #10 zone and a winger as the available passing option, much of Villa’s build-up would come in wide areas. Until they unveiled the spark of Grealish, Villa lacked central penetration. Liverpool focus more on building play in central areas, which will create slightly different passing angles for Benteke to focus on. There is also less of an urgency to progress play, and Benteke’s natural inclination to move play onwards will likely have to be curbed. 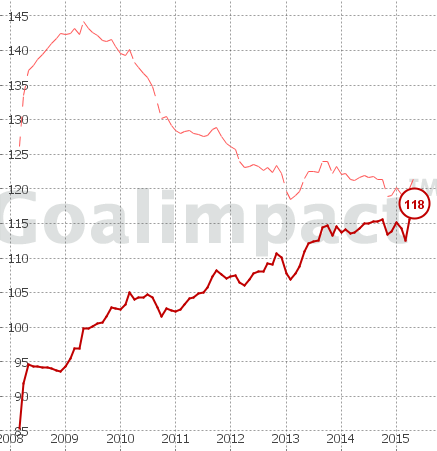 Benteke’s GoalImpact of 118 suggests he is a slightly above average player. His team does not get much worse when he is not in the team. This is incredibly similar to free transfer Danny Ings’ 116. There can be no doubt that this is a very risky transfer for Liverpool. There is very little similarity between the attacking strategies of the two teams; and even in his current system, there is doubt about whether Benteke is worth the £32.5m Liverpool are paying. So much of Benteke’s game is built around his aerial ability, and his reactions to second balls from crosses (both from deep and advanced positions). Benteke’s aerial ability cannot be doubted, but the downfall of Mario Balotelli at Liverpool has been because of his poor movement in behind the defense. This is an area where Benteke is also poor. Unless the game is in transition, Benteke seems unable to make intelligent runs, and is caught offside a frustrating amount. Play needs to go through him, and this seems unlikely to be a good fit at a bigger club than Aston Villa. The fact Liverpool have buckled on negotiations and agreed to pay the £32.5m fee seems more due to desperation than good preparation. For all the furore surrounding Raheem Sterling’s contract, it ended at the same time as Christian Benteke’s; 2017. There is no doubt that Liverpool could have found a better fit for their system, for a cheaper fee. Spending a huge fee on a player who so clearly suits a different style of play than the one the team currently employs hardly ever works out well. This appears to be a transfer where Rodgers and his staff have identified a talented striker with poor movement, that doesn’t really fit the system, but they feel can be moulded into it anyway. Sounds familiar. Another big thanks to Colin Trainor (@colinttrainor) & Julien Assuncao (@birdace) for allowing us to use their data throughout this article. What would be interesting is a comparative with other potentials. I believe rondon is a better option. Absolutely fantastic article to read if you love to drool of statistics that are meaningful (with the right information provided). Well done guys, this should hopefully reach a lot of the doubters. Benteke can be a true hit for Liverpool. Um….Jeroen….not sure u missed it but the article is the basis of doubting benteke’s transfer to lfc. It’s not backing him to be a hit. And that’s a very interesting idea, actually. Beginning to see that Benteke is playing in almost the same way that we predicted, and it’s probably affecting Liverpool’s play more than his; would make for an interesting article. One to think about. Appreciate the comment, thanks.